According to Google, the latest 8.1 Chrome for Android update protects web surfers via the newly added “Safe Browsing” feature. Here’s why. Safe Browsing has been on desktop versions of Chrome for more than 8 years, during which the company claims the warning system has protected more than a billion users. Now, the protection is available to Chrome for Android users. Why it matters to Android. 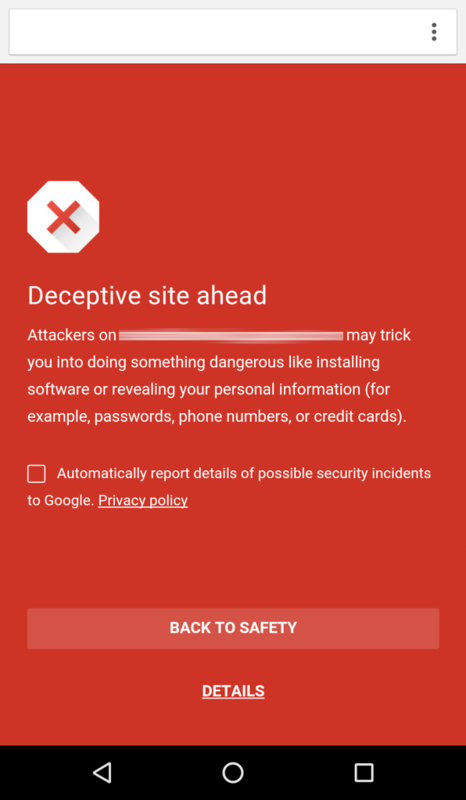 With a red warning page that can display a number of warnings, such as “Danger: Malware ahead!” or “Deceptive site ahead,” Chrome for Android notifies and shields you from malware and phishing or social engineering scams. Malware can contain viruses and other unwanted software that could steal data or information. On the other hand, phishing or social engineering scams will try to trick you into giving up personal information like credit cards by masquerading as banks or other legitimate entities. The notification is triggered if the site you’re trying to visit falls in Google’s database of malicious sites. Phishing or social engineering scams often are sent over email. More than 156 million phishing emails are estimated to be sent every day, according to a 2012 Symantec report. If you dare, you can turn off Safe Browsing in the Privacy panel. According to Google, Chrome is warned via a regularly updated registry of allegedly toxic websites. The company claims they regularly use their technologies to spotwebsites that have characteristics indicating malicious content. Google also accepts unsolicited reports of websites running malware and phishing. Also, if you think Safe Browsing has incorrectly blacklisted a site, you can tell Google. Like all information online, the warning message is made possible by a data transfer. According to Google, the company first sends data on “riskier” sites to Android owners before sending over information on other potentially problematic websites. With no announced plans for an iOS release, Android is the first mobile version of Chrome to receive the Safe Browsing warning message. Unlike non-jailbroken iOS devices, Android is exposed to third-party apps that can be installed outside Google’s official Play Store. This vulnerability puts Android in a precarious situation when browsing the web, making the added safety welcome. “As more of the world relies on the mobile web, we want to make sure you’re as safe as can be, as efficiently as possible,” Google spokespeople said on their blog.